Lana Popham's 2009 Campaign: Yaaaaa for Jack Knox! We're neck-deep in plastic. Is it time to bag the bag? Most notable new trend at this year's TC book sale? The arrival of the reusable shopping bag. Every second person was packing one of the suddenly ubiquitous fabric carrier bags, the same ones that you always forget to throw back in the trunk after unloading the groceries. The sight would have warmed Lana Popham's heart. The Saanich farmer -- she has Barking Dog Vineyard -- has been doggedly campaigning to eradicate plastic shopping bags from the local landscape. 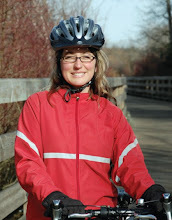 In fact, she'll be back in front of the Capital Regional District's environment committee tomorrow, arguing her case. She would like to see plastic shopping bags banned altogether, but failing that, figures the CRD could drive them out of existence with a 50-cent-a-bag charge. "That alone would cause a voluntary ban." Alas for Lana, the CRD says her idea is a non-starter, that the regional district doesn't have the authority to ban or tax bags. All it can really do is ban them from the landfill, but a staff report doesn't recommend that, either. Measured by weight, plastic bags make up less than one per cent of the rubbish in the Hartland dump. Popham doesn't dispute that. "We all know it's not a landfill issue," she says. "If the bags all got to the landfill, that would be fine." What ticks her off are all the bags that end up in fields, or clogging culverts, or washing around the ocean. Besides, she says, oil is too precious and finite a resource to waste on plastic bags, which are made from petroleum. It has been estimated that more than 500 billion of them are used each year. Popham's arguments echo those being heard worldwide. China has banned ultra-thin plastic bags; by some calculations, that will save 37 million barrels of crude each year. Ireland has effectively taxed bags out of existence. Last April, the Manitoba town of Leaf Rapids became the first Canadian town to ban them. In November, Langford's Real Canadian Superstore, which used to hand out 950,000 bags a year, became the first major retailer in B.C. to do away with them. In January, CRD board member Vic Derman, a green-leaning Saanich councillor, asked regional district staff to report on ways to curb the excessive use of plastic bags. Staff have now responded with recommendations to increase education about recycling and alternatives to plastics, to ask that bags be included in provincial recycling regulations, and to look at a model bylaw similar to one governing pesticide use. Those recommendations will be heard by the environment committee tomorrow. So will the arguments of Popham and, from another perspective, a representative of the Canadian Plastics Industry Association. The industry argues that bans and taxes don't work, that they actually lead to an increase in the use of plastics and paper. "The prime example is Ireland's bag tax, which led to a 21 per cent increase in the amount of plastic consumed in Ireland as people substituted heavier plastic kitchen catchers which could be purchased off the shelf tax-free even though the number of bags distributed at checkout declined 90 per cent," stated a letter to the environment committee from Cindy Cirko, vice-president of the plastics association. The plastics association proposes forming a partnership with the CRD and retailers to cut excessive use -- persuading big-box stores and others to launch in-store recycling programs, that sort of thing. Popham isn't swayed by the association's arguments against bans and taxes: "It's their livelihood." All of which still leaves the question of what you are supposed to do with your plastic bags right now. You can't put them in your blue box. (The CRD looked at adding them to the blue box program in 2005, when it was expanded to include other plastics and pizza boxes, but rejected the idea; they tend to blow around the street and, with little commercial value and a low tolerance for contamination, are unattractive to recyclers.) Most grocers have in-store recycling bins for plastic bags. Most now sell their own carrier bags, too -- an option, as the book sale showed, that more and more people are starting to take.